made of three liquid layers and running at 700 °C. One of the cutting-edge areas of study in chemistry today is materials chemistry for battery development. Researchers at Massachusetts Institute of Technology have developed a new type of battery that could provide affordable, large-scale energy storage. Current batteries are unable to meet the low-cost, long-lifespan demands for supplementing our electrical power grid. This new type of battery would make it economical for utility companies to integrate wind and solar power with more traditional sources because they could store the electricity from these intermittent sources. Led by Materials Chemistry Professor Dr. Donald Sadoway, the MIT team has developed a liquid-metal based battery made from antimony, magnesium, and a mixture of magnesium-, potassium-, and sodium-chloride salt. Heated to more than 700 °C, these materials melt; and because they have variable densities, they settle into three distinct layers. 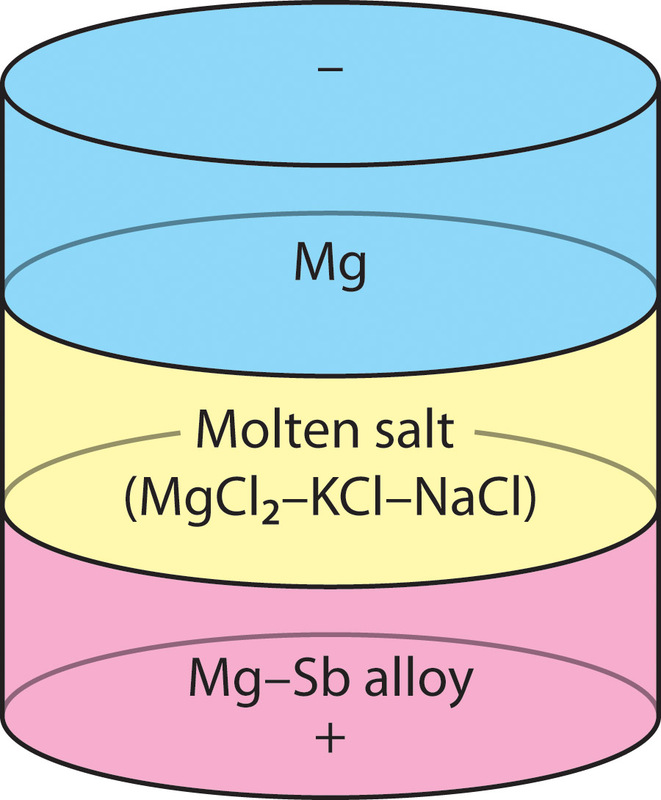 The top (negative) magnesium layer and the bottom (positive) antimony layer form the electrodes of the battery, and the middle molten salt layer is the electrolyte. An electrolyte is a medium through which charged particles flow as the battery is charged or discharged. As the battery discharges, the magnesium atoms ionize, losing two electrons to the external circuit, and travel through the electrolyte to the positive electrode where they pick up two electrons and change back to ordinary magnesium, forming an alloy with antimony. Charging the battery runs the process in reverse, driving magnesium out of the alloy and back across the electrolyte to the negative electrode. While most batteries do not work well at high temperatures, this system needs high temperatures to run. Dr. Sadoway’s was inspired by his earlier work on the electrochemistry of industrial aluminum smelting. Sadoway says his new battery process is like running a smelter in reverse. Why magnesium and antimony? There are a couple good reasons, first of which are their different densities which allows for stratification. Also, both elements display good electrochemical properties. But most import, both are relatively abundant and inexpensive elements compared to other elements that have been tried. That keeps the cost of the batteries low. They have achieved up 69% energy efficiency with this setup. The team isn’t the first to research liquid-battery systems, but Dr. Sadoway says he and his team are the first to produce a working storage system in this way. Over the past few years, they have scaled up their experiment from about 4 cm in diameter to a 15 cm prototype with 200 times more storage capacity than their original version. Currently, they are focusing their efforts on improving the insulation and heating of the containers that hold the molten materials to reduce the operating temperature and cut energy costs. According to Sadoway, if they can commercialize the technology, “…it could be a game-changer”.